What We Do Suppliers - Jiaxing Jinnaike Hardware Products Co., Ltd. 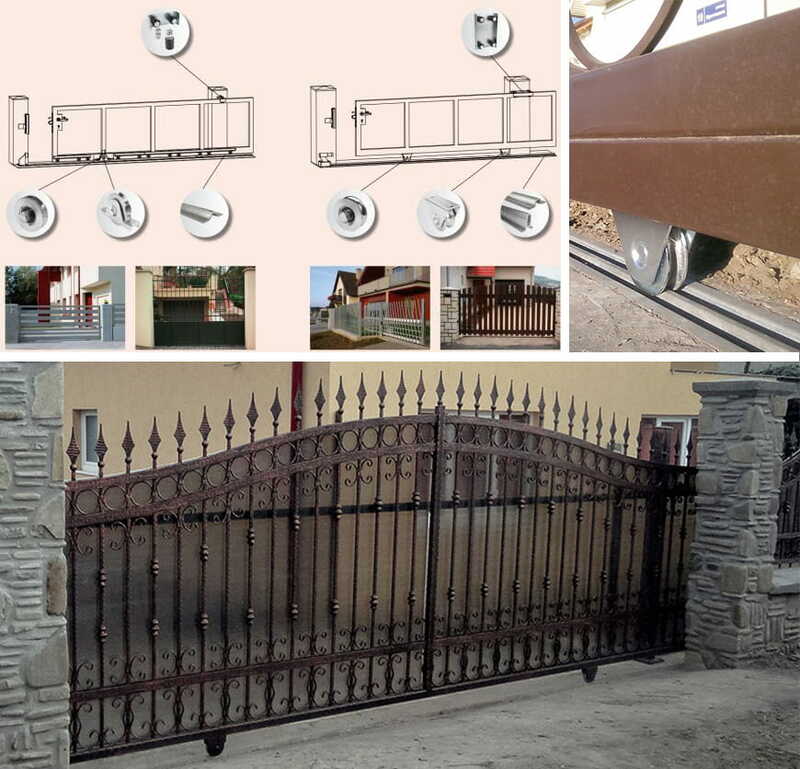 The sliding cantilever gate is different from traditional gate, under the force of gear rack in gear with electric motors; it can slide over the two sliding cantilever gate wheels that are fixed on the ground to realize opening the gates. Due to the two wheels hold in the track, this gate’s operation is unaffected by snow, frost on the entry. This cantilever gate wheel is very popular around the world, and easy to use by remote-control unit. especially the snowy, bad weather countries. All parts are galvanized to fight again the rust and corruption. It is easy to install and durable with minimal visible hardware that avoids many of the usual maintenance and efficiency problems due to dust and snow. As a manufacturer, we produce all accessories this kind sliding cantilever gate. The hardware combined with a range of the high quality component, such as all size sliding cantilever gate wheel (3 wheels, 5 wheels, 8 wheels, 9 wheels, 10 wheel, 16 wheels etc. ), gate stopper, guide bracket with nylon roller, end cap, adjustable fixing plate with hook bolt, guide wheel, cantilever gate track, end stop and gear rack etc. Any interesting please contact us by email, thanks. Sliding gates do offer you the advantage. A tracked sliding gate runs on wheels along a grooved steel rail that is buried just below ground level. 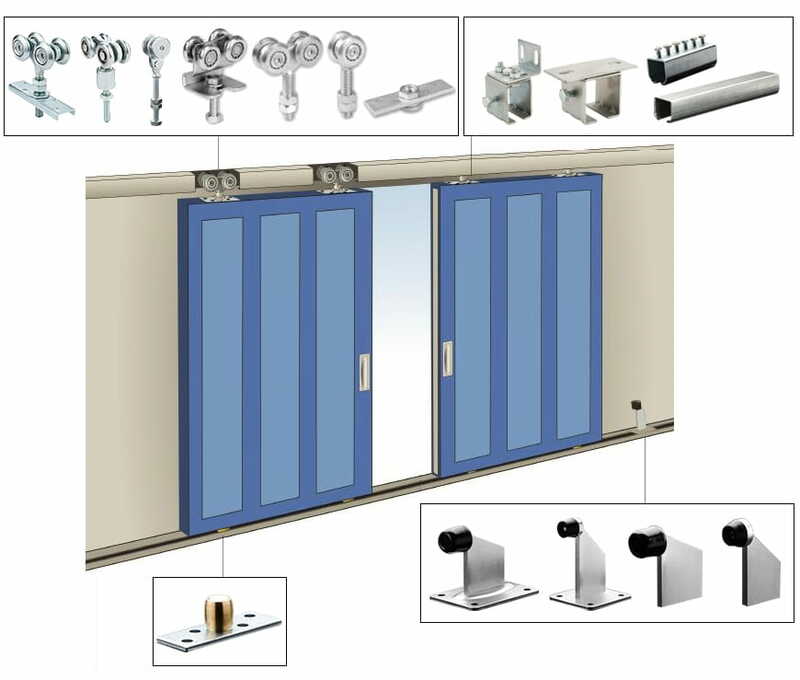 We can supply the sliding gate accessory and sliding gate kit/system for sliding gate, such as sliding gate wheel , sliding gate track/ rail ( U track & V track) ,nylon roller bracket, end stop, etc. Sliding gate wheel is installed to the bottom of sliding gate. The track/ rail is bolt down on the ground or installed in the ground, it depends on which track/ rail you choose. Besides, the nylon roller bracket and end stop can be used for the sliding gate. The nylon roller bracket can be installed to the post or wall to keep the door move smooth. 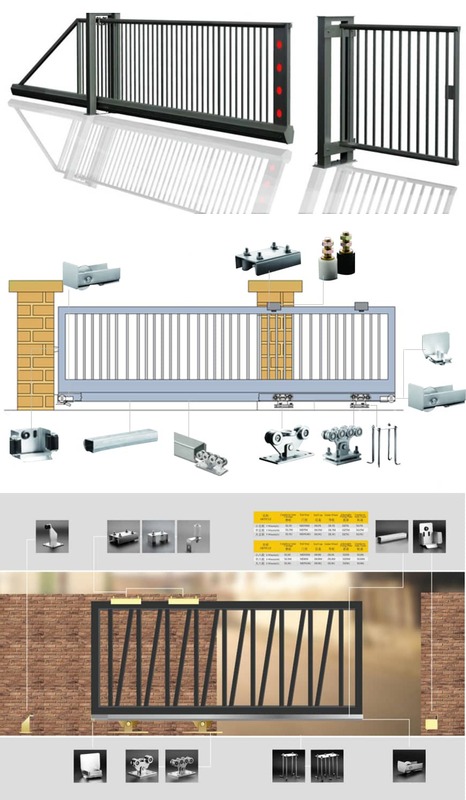 Many different kinds accessory for sliding gate can be chosen. 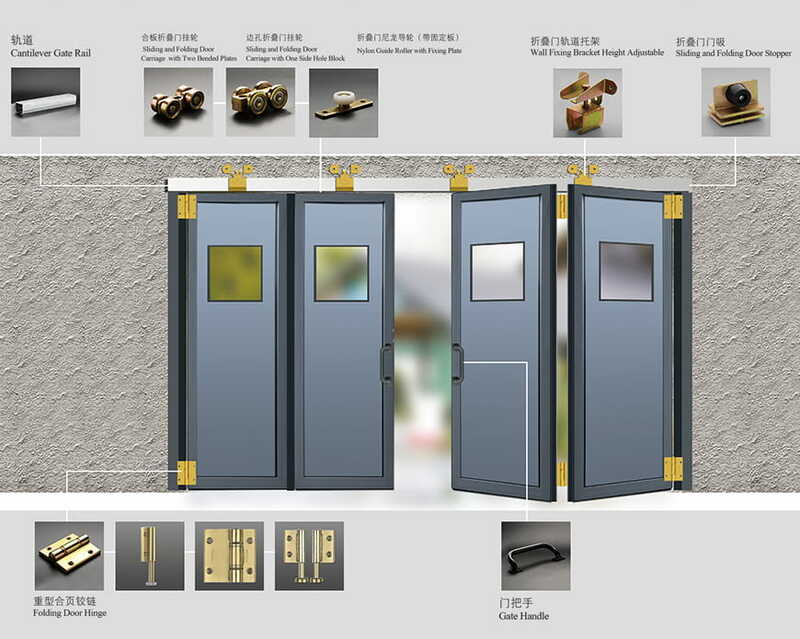 Sliding Hanging Door is widely used for house doors, factory doors, garage doors, ect. It’s very easy to be installed, and won’t affect the ground. 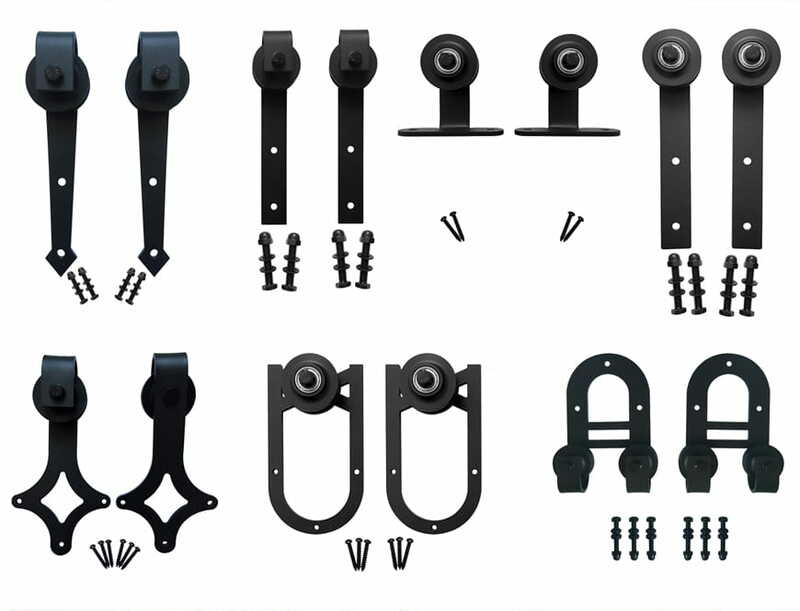 Our factory can supply a full set accessories for different types of the sliding hanging door, including the hanging door roller, hanging door track, wall fixing bracket, bottom guide roller, etc. Our factory is a leading and professional manufacturer of gate & fence hardware for many years with ISO9001:2008, SGS and BV certification. If any problems you have, warmly welcome you to contact me directly, thank you. 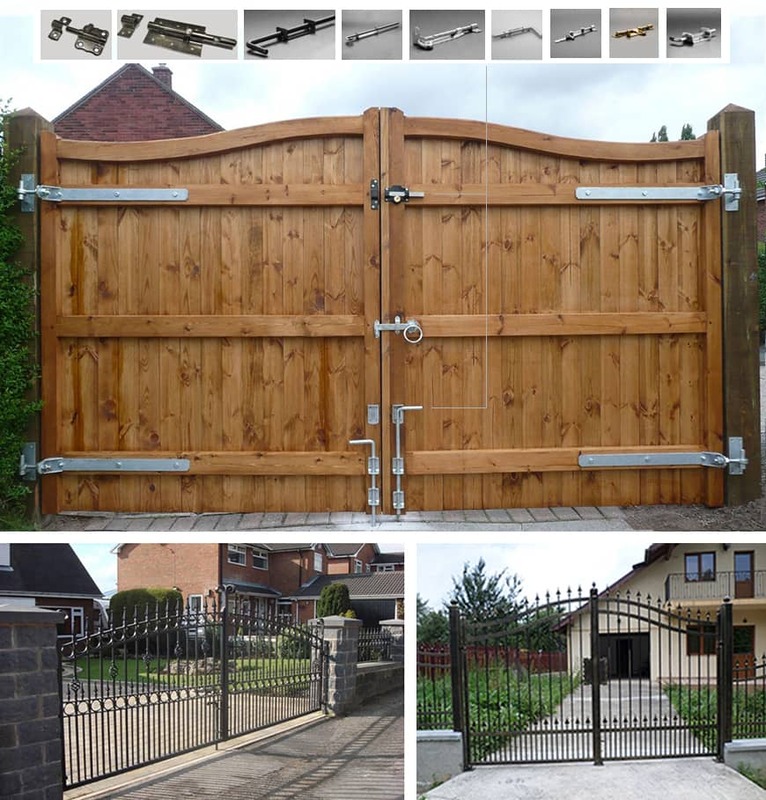 Steel swing gates, wooden gates, mainly used for garden, factory and so on. We have swing gates hinges, bearing hinges, welding hinge, long plate hinges, ect for these gate. Adjustable gate hinge can be adjusted, surface is zinc galvanized for good protection. Long plate hinge is strong holding for the gate. It’s easily to install this hinge. Bearing hinge installed on the upper or bottom of the gate, good capacity for the gate. Rotating Smooth. Roller shutters have many applications, including doors for vans, garages, kitchens, schools, prisons and warehouses. In some parts of the world, roller shutters are subsidized by local governments due to the inherent security benefits. Our company specialized in manufacture the Spring box, Hook, Handle for roller shutter door. Spring box: Formed steel extrusions designed to protect the roller assembly, used with roller which once is Steel tube supported at either end by an end plate. Hook: Steel, single wall, used for securing and moving shutter door. Handle: attachment shutter door, made from steel, an object that can be moved the door by hand. Folding doors are a combination of sliding and folding parts, door panels folded like an accordion in a package that can be easily moved to the side and slightly protruding inwards or outwards. In this case the package can be fixed at any place of the doorway by means of special brackets. When folding door carriage on the guide track flaps meet in an accordion, releasing for the passage of a doorway and not cluttering the interior of the premises. An important feature of folding "compartment" door is the fact that they can be installed in openings of any width. 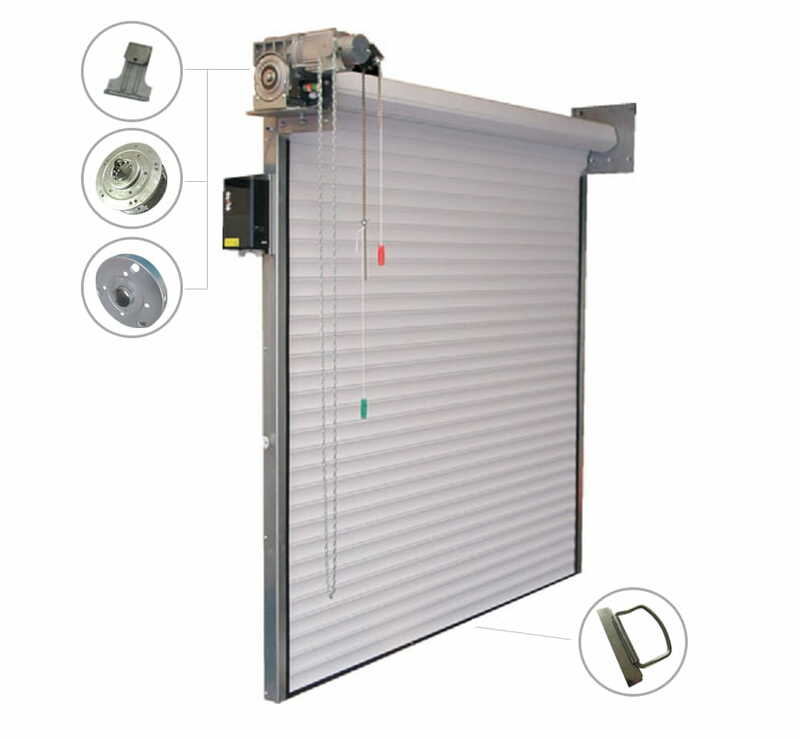 To fix the "accordion" in the open position, folding door stoppers are used. Folding door have a strong vertical slats interconnected by hinges. Attaching folding door is made with the help of the hinge axis, which is located at the jamb; reference points are wall fixing bracket height adjustable mounted on the lower or upper horizontal track, and if two of them, then both. The extreme points of the position of the folding doors flags fixed-stoppers. Vinyl post cap has become a very popular option for Add A Link Fence’s residential and commercial customers over the past 10 years. Vinyl has become popular because it is an attractive, low maintenance and weather resistant option for any fence project. Vinyl post cap fences are made from polyvinyl chloride (PVC). Manufacturers mix PVC resin with ultraviolet inhibitors, toners and stabilizers to form vinyl fence panels that are malleable and can be extruded or cast into shapes. When the material cures, it becomes rigid and resilient. The process allows vinyl fencing to be made in many styles and sizes with fence caps and decorative tops. Add A Link Fence also offers vinyl fencing in many different styles and shapes including: privacy, semi privacy, picket and ranch. We are a professional gate hardware accessories factory , we supply various Vinyl post cap and metal post cap to many different customer from all over of the world . We , Jiaxing Jinnaike Hardware Products Co., Ltd . is your reliable product supplier partner . Metal Post Cap style metal post caps will add a distinct, yet classic touch to your outdoor projects. Use alone or coordinate with other metal or solar metal post caps for added style and radiance to your deck, fence, dock, gate, porch or mail posts. Made of the finest metal in a variety of colors to enhance any outdoor look. Gate latch/ bolt mainly used for swing gate. 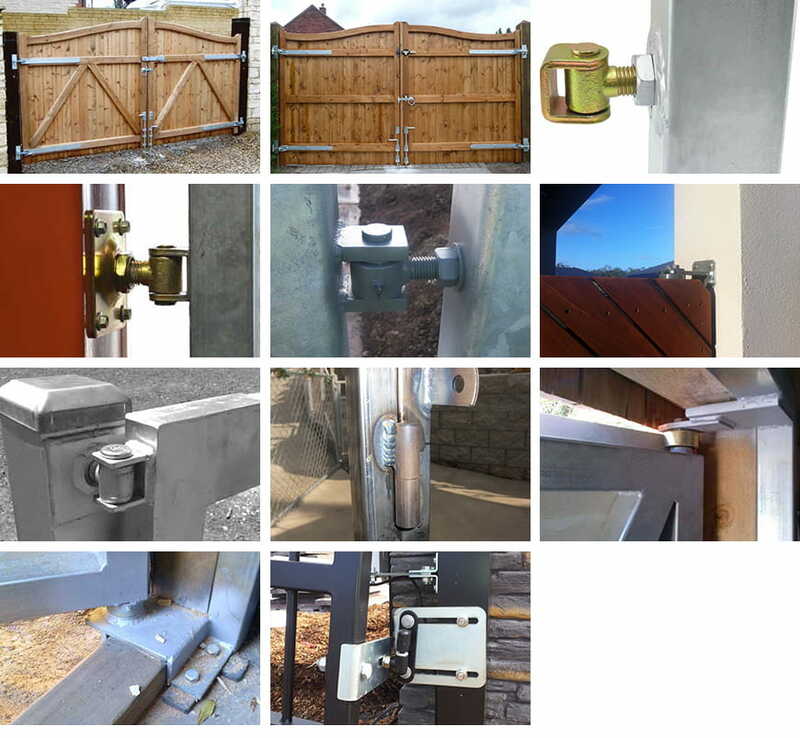 It can be easy to install onto the swing gate .The gate bolt can make the swing gate closed. When the gate bolt used for the gate, it is easy open and closed. Referring to our slide bolt, it isn’t just for gates. Easily attach the sliding bolt style latch onto windows, cabinets, gates and more for secure closure and easy opening. We have drop down bolt, long bolt, spring bolt, bolt with the greek sign, cane bolt with hook, slide bolt. 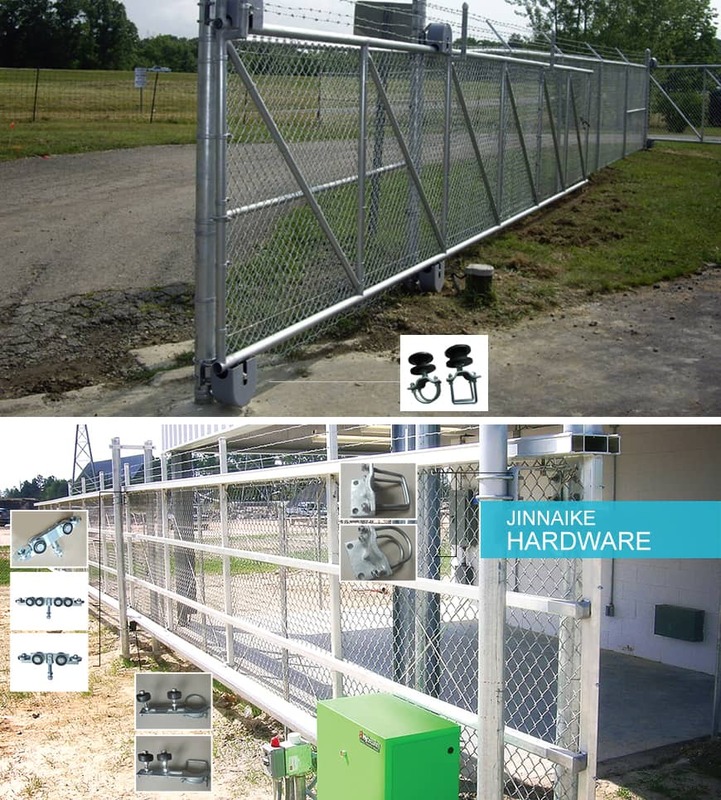 Chian Link Fence Gate is used for chain link fence which is widely used all over the world, it’s very durable and easy installed, our factory can supply a full set accessories for different kinds of the chain link fence gates, including the Nylon Cantilever Roller, Internal Gate Truck, Support Bracket, Guide Rollers, Slide Gate Receiver, etc. Our factory is a leading and professional manufacturer of gate & fence hardware for many years with ISO9001:2008, SGS and BV certification. If any problems you have, please feel free to contact me directly, thank you. The cableway system is used to banana farm, banana plantation, banana plant or banana field, our banana trolley are designed for cable system to transport banana bunches. Banana trolley also called banana hook .it is consists of wheel with double bearings, hook , chain ,plate and other spare parts. Excellent transportation system can be transported by one person for save time and money. Maximize space and increase productivity. Sliding barn door hardware kit utilizes a spoke wheel and large plate that looks excellent with larger doors and installations. A rustic feel perfect with reclaimed lumber or large door assemblies. We have seven kinds of barn door rollers you can choose. The material of the barn door roller is iron and the color is black. Above all, this kits can be used about 100.000 times and the weight capacity is 350kg for per barn door roller. We can provide you 2m sliding track, also other length can be offered. All hardware for setting up the sliding barn door presentation included. 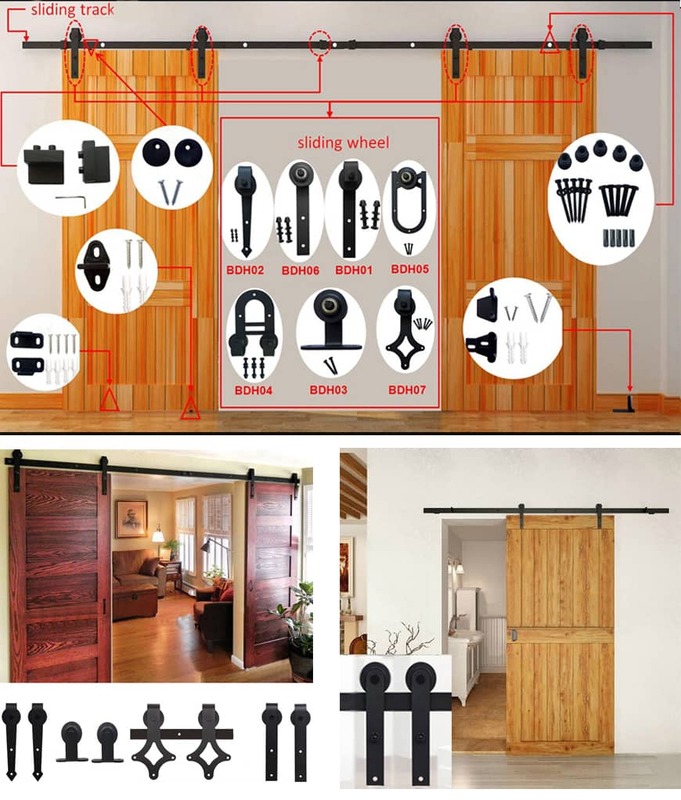 The feature of the barn door accessories are sturdy and stable. Turn your normal door into an innovative sliding door.